Camellia ~ "A velvety floral bouquet that reveals all the delicacy of the Japanese camellias. An expression of pure femininity." The notes feature white tea leaves, Umé plum, camellia petals, magnolia, woodsy and ambery notes. Paradise Lost ~ "Free spirit creatures, flower children and mystics altogether celebrating the enlightenment of life. A get-away to the sun infused Goa beaches in India. Feminine." With Indian limette, bergamot, jasmine, tuberose, Bourbon vanilla, sandalwood and musk. 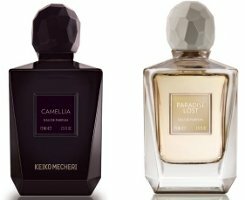 Keiko Mecheri Camellia and Paradise Lost will be available in 75 ml Eau de Parfum. I can never keep up with this line, though these do sound very pretty, particulary the Camellia. I can’t keep up either! Too many too fast. Do they know that ‘Paradise Lost’ is a tragic, epic poem concerned with the LOSS of Eden, by Adam and Eve (2 humans) who ate of the tree of good and evil??? I am guessing it was not inspired by the poem. Good point – maybe KM should have called it Paradise Found. If they were going the Milton route it would have had to have been paradise regained! It doesn’t seem to have any reference to the poem at all, I agree. But why call it Paradise Lost then – except that ‘Paradise’ has already been used. Its hard to see ‘Paradise Lost’ as a positive thing, surely? I haven’t been too excited about the more recent KM releases. New release fatigue strikes again. Paradise Lost does sound sort of good, if not exactly groundbreaking. I am way behind. I’d like to try them but it’s hard to keep up — they did 6 last year. When I hear “Goa” I think “hot & spicy”, though of course this references the food, not the scenery. But if Keiko had added some peppers, curry, cumin to that tropical beach, I’d be all over this one! Paradise Lost sounds good to me. I’m still backed up with lemms though – I want to get the Attar de Roses…. wait—you’ve not tested Attar de Roses?????? Yes, I’ve tested it! *You* sent me a shop sample, silly. I really like it. I’m just waiting for the right moment to go full bottle. Now that I have to horde my 40 or so mls of AG Rose Splendide, the moment will probably come sooner than later. It is very pretty. KM is a dicey line for me–when it’s good: it’s very good. when it’s bad it’s almost always a bit of a scrubber. Peau de Peche is a favorite but I agree – the rest are just so so. I want that love Paradise Lost. I have been looking for peaches lately….and the two best peach scents I’ve found are Peau de Peche and SoOud Ouris (which is gawgamous btw). Peach can so easily turn artificial and ….I don’t know, cough syrupy? , anyhow, the search continues but so far, the two above are by far the best. I know someone will jump in here with “What about MDCI Peche Cardinal??? *gasp* ” ….but that one can go a little too sour sometimes….and it’s mighty spendy. Here comes a tomato, but I didn’t care that much for Peche Cardinal – it has a lovely cinammony syrupy rose thing, but didn’t really get to me as something extraordinary. It made me think of a watered down Nahema. That’s peaches and rose enough for me. I love watching yours and Ann’s interchanges, adorable enablers, both! What did you think of KM’s Mogador? I thought it was a lovely rose. Dinazad sent me a sample, and it was straighforward lovely red luscious rose on me. I’d not heard of it. The KM line is so big, and I’d missed it. Just wondering if you’d tried it. I really like KM Les Zazous, Damascena, and Isles Lointaines. Attar de Roses is about nothing on me. I’ve just tested Isles Lointains and Tuberose and still haven’t gotten to Attar of Roses! But you know what? these bottles feel pretty good in person. A nice solid feel and the “black” glass is nice. I thought in pictures they were kind of ugly…better in person.